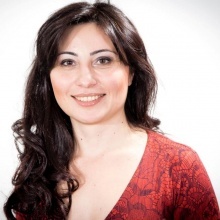 Tatevik Pirumyan has been actively involved in PR sphere since 2007. She has experience in both implementing researches and designing and launching PR campaigns, public debates. She has been designing public awareness rising campaign strategies, managing PR projects, preparing leaflets and other materials for dissemination of information on a relevant topic. During working career Tatevik has cooperated with such agencies as UNDP, OSCE, GTZ, USAID MAAC, USAID CAPS etc. Besides she is a Master of Sociology and has more than 9 years of experience in the area of social researches (using both qualitative and quantitative research methodologies). From 2007 to 2010 she worked as a lecturer at Armenian State Teachers’ Training University Named after Kh. Abovyan (Sociology of Economic Life”, “Sociology of Ethnic Groups”). Currently she conducts courses of “Sociology of Communications” and “Social Marketing” in Armenian State Linguistic University Named after V. Brusov.